These Boston Terriers are either in foster homes or no longer wanted by their owners and are looking for forever homes. Sorry, but I do not have any other information about the Boston Terriers listed on this site. You need to contact the email or phone number listed with the Boston Terrier for more information. Thank you! There is a female, spayed, Boston Terrier, 7 years old in need of a home. Her owner has been moved to a nursing home with no chance of returning to their home. She needs a good loving home. Please pass this to any Boston lists that you know of. If you know of anyone interested, please contact me at cinvanban@aol.com. She is a nice, loving Boston lap dog. A person rescued these puppies and are now looking for homes for them. They are now 6 weeks old. The mother most likely already has a home. I have 8 beautiful male/female Boston Terrier/Pitbull mixes six weeks old. Six are black and white and one has Doberman markings and one has Shepherd markings. They all have short fur. Mom is 25 pounds and dad is unknown. Mom has stand up ears and I already have a family for her after she is spayed. The adoption fee is $40 for each puppy. I have more males than females. These puppies and momma were found on the street at 2 weeks old. 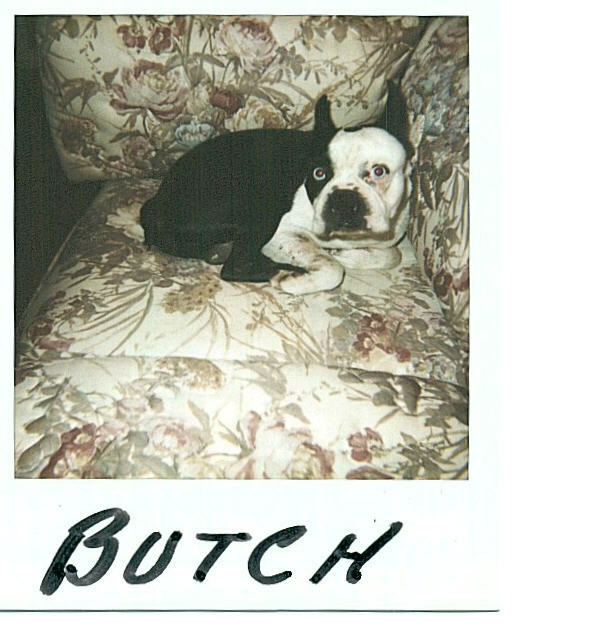 Butch is approximately 1 to 1 1/2 years old. Neutered, Heartworm negative, on HW prevention and has had all of his shots. please feel free to contact his foster Mom - Edaleeh@msn.com. George - larger than your average Boston Terrier with longer legs and body. George is a a very kind and gentle boy. George is housebroken and loves to sleep in the bed. George was near-death (starving) when found in the street, and is now up to about 27 pounds. Nelson - a very sweet boy who is very cute and playful. He has a half-white/half-black face. He is very loyal and loving; weighs 19 1/2 pounds. Kearby - cute as a button. Kearby is short and squatty and has a very soft coat. He is just adorable. Kearby weighs 13 1/2 pounds. Angel - Angel was found wandering the streets, and was injured. She was taken in by a kind family who nursed her back to health. She is very sweet and is a pretty girl. if you are seriously interested in this dog. size: about 20 pounds - typical Boston markings. Kids: has been around visiting kids 7 years & up. Prefer home with another dog. Prefer home where someone is home most of the time. Dog is located on the Mass/NH line and this must be an open adoption. 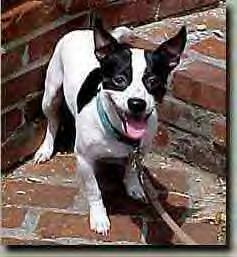 Curlee is a year old male Boston Terrier. He loves kids. NO cats! He is also DOG aggresive, so he NEEDS to be a only dog or he is fine with females. He is a outside dog and is NOT housebroken however he is crate trained. Potential owners will be screened and will fill out a contract. If you are interested in Curlee please e-mail us. Also he is AKC, black, brindle and white. We WILL NOT ship so if you don't live close to Rochester, MN don't BOTHER! PJ - he's an American Bulldog. If anyone is interested, or knows someone who is, please let me know. I'll be happy to help out any way I can. found. Their names are Fancy and Chance. Gigi is a 3 year old Boston Terrier mix. She takes on the BT traits mostly. Gigi is spayed & weighs approx. 20 pounds. She has a brindle & white coat. She is currently in a foster home with other animals & kids. She would like to be top dog so it would be best if she was the only dog. She loves cats though!! She is great with kids. Gigi is very affectionate. She needs a loving home that will take time & let her know they love her. She is very loving and fun -- just needs some more attention to settle her down. She is current on shots, spayed, hw neg and on prevention -- ready to go. Mugsy is a six year old small male. He spent 4 years of his life in an attic with no health care. He just needs to gain weight and be loved. He is neutered and is up to date on all shots. E-mail contact for further information on this rescue. TN Valley All Breed Rescue, Inc.
first, but warms up quickly. Adoption application, contract, and fee required.